Remember when I mentioned Marmoset Music, the innovative music searching website? There you can filter the search results with a set of adjectives to describe you mood. I didn't want to make it easy for the search engine so I chose 'quirky', 'anthemic' and 'bouncy'. Two songs were left: the other one I forgot immediately (then again, the song was fittingly titled 'Whatever Etc.') The other one however had me instantly hooked - even though it was an instrumental version - so I looked it up on Spotify and fell in love straight away. 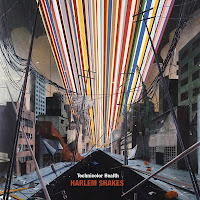 The band reminded me a lot of the previously introduced Harlem Shakes and funnily enough, both bands have only released one LP so far whose artworks also bear a striking resemblance. However, while the Harlem Shakes record can occasionally feel like they're a bunch of wide-eyed indie kids high on Prozac (even despite their witty lyrics), Soft Pipes offers much more mellow music to listen to - they're like the aforementioned band's laid-back West Coast cousin. 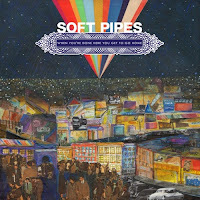 Soft Pipes, the solo music project of L.A.-based Anthony Polcino, was founded after Polcino's previous band (named Low Vs Diamond) split in 2010. A debut album was recorded and released the same year, and that album is the excellent, albeit quite exhaustingly titled When You're Done Here You Get To Go Home. From "The Boy I've Been" to "This Place", the album is a pleasantly relaxing listen. 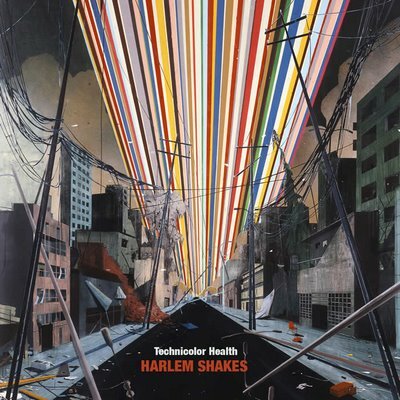 While there are no especially weak tracks or 'fillers', the most uptempo song "The Antihero" actually turns out to be one of the less memorable tracks here, and Polcino really seems to excel in a bit slower tracks such as "Golden Grace", whose lyrics reflect the underlying dreaminess of the record: "I pulled myself up out of bed / to make sure I was still alive / My eyes just saw in white and grey / Last night I met my golden grace / and she spoke in little rhymes / that made no sense to me today". The album experiments with different kinds of instrumentation, even reaching towards folk music ("Old Dirt Road") and blues ("Talksick Blues"). "This Old King" could almost pass for a Coldplay song (in a good way, fear not). There are several mention-worthy highlights. "You Heard Me Calling" is a wistful tune where the storyteller longs after a lost love: "You're in my head now / for the rest of my life / You heard me calling to you / But you weren't listening right". It also comes with one of the best choruses on the album. "Activate Me" is a soaring number that feels like an aural equivalent of the overwhelming feeling you get after climbing on top of a high hill and then seeing the landscape bathe in sunlight and feeling your lungs fill with fresh air while the breeze is playing in your hair. My personal favourite however would be the sentimental "Glass Heart" which has proven to be quite the earworm ever since I first heard it. "No you don't know what I know" is a haunting line that will make you replay the song again. And again. And before you notice, you've had it on replay for half a day. Yes, it has happened to me. You're probably able to point out the moment I discovered the band. But yes, it's a terrible shame. Way too often so many exciting and talented artists go largely unnoticed and so has it been for Soft Pipes as well. But we don't need to care about that. We don't need to bother ourselves with chart positions or album sales. They should mean nothing to us. Instead, I'm a music blogger telling you: this is a good album. If you want to listen to some wonderful indie music, here's an album for you. Simple as that, eh? Try at least: "You Heard Me Calling", "Glass Heart", "Activate Me"